The Sector Seven Spectrum mirror is solidly built. Note that the light is directed forward and to the side. That matters. Driving off-road at night offers an entirely fresh perspective on your favorite riding area. You’ll see the same terrain in ways you never expected. It can be a beautiful thing with the right lights. We just never suspected that a large part of the “right lights” would be a pair of machined-from-billet aftermarket mirrors. Over the years off-roaders have come to expect great products from Pro Moto Billet Fastways. The company makes innovative products by whittling them from solid blocks of aluminum. 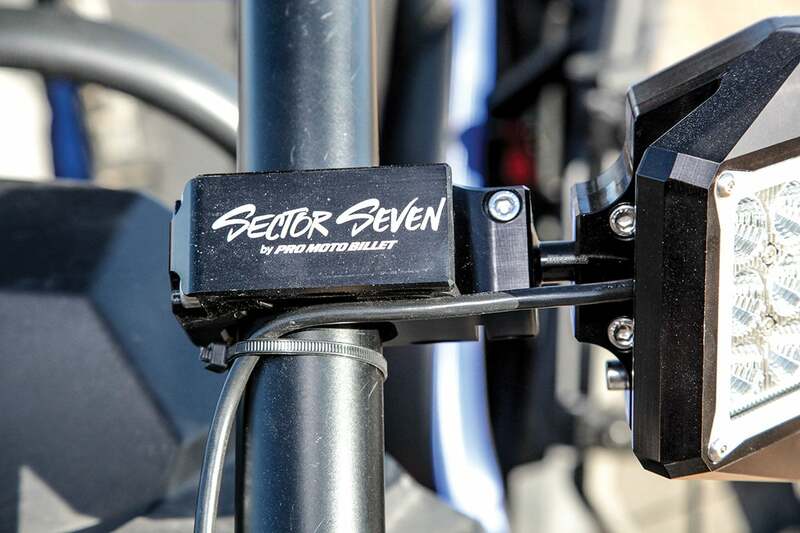 Sector Seven is the newest division of Pro Moto Billet, and the signature product of the line is the Spectrum lighted mirror set. The mounting bracket is equally impressive. The wires are supposed to run under the bracket if you read the directions. Each of these mirrors starts out as a large, U.S.A.-made aluminum 6061 billet. It heads into a CNC machine at the company’s headquarters in Nampa, Idaho. Each mirror is fitted with a heavy-duty universal mounting clamp. The clamp is super strong, and it fits any tube shape between 1.25–2 inches. It generates a lot of aluminum chips to remove everything from the billet that doesn’t look like a Spectrum mirror. Making the mirror would be relatively easy, but adding 7200 lumens of LED light power to the front of the mirror greatly adds to the difficulty and complexity. On top of that, the LEDs face forward and to the side, so the mirror cannot be flat. That means that the required billet each mirror starts with must be over double the size it would need to be for a normal billet mirror, and the machining processes are more complex as well. All of the trouble in manufacturing is worth the effort, though. 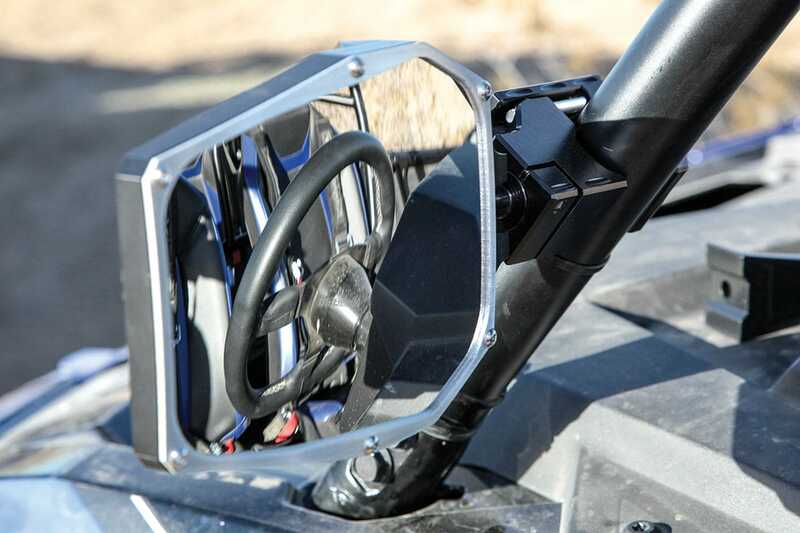 We were able to mount the mirrors to the cage of a Polaris RZR Turbo 4 S in mere minutes. The install was going so effortlessly that we ignored the directions. Had we read them, we would have seen that the cage clamps have an opening for the LED light wires. If you use the wire openings, the install is super clean with no wire-ties required near the mirrors. The mirror wiring includes an on/off button, but we used a $24.95 lighted dash switch and a $19.99 Auxbeam wiring harness that Sector Seven sells. We had a chance to drive with these mirrors on two different machines in the dunes and on normal trails. Simply put, they are amazing. With half of the LEDs angled to the side and the rest directed forward, you get a 210-degree field of view. You can literally see around corners. 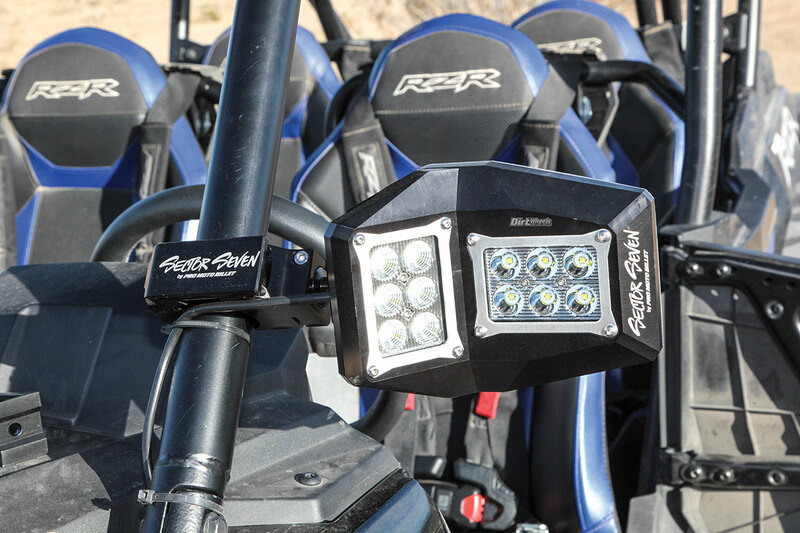 We thought the lights on our new RZR S were very good for stock, but simply adding the Spectrum light mirrors changed our minds. We were able to see much better and drive with far more confidence in the dark. After driving with the added illumination of the Spectrums, we realized how dim and yellow our stock headlights were. No matter how bright your lights are, you always feel like you are looking down a dark tunnel as there is little illumination to the side. The lights on the Spectrum mirrors create enough light to the side that you don’t have that tunnel-vision feeling, and you are more easily able to recognize and negotiate turns at night. With just the Spectrums mounted, we were able to negotiate sand dunes in the dark with confidence with no additional lighting added. Later, on the RZR Turbo S, we supplemented the mirrors with a light bar, and we were living in a new, brighter world driving at night. Forgive us for going on about the lights, but they are amazing. But as handy as the lights are in the dark, the convex mirror part of the Spectrums will get a day-and-night workout. The field of view is great, the mounting is rock-steady, and we didn’t have to make any mirror adjustments whether we were slamming whoops or landing jumps. Nothing is perfect. As you may have surmised from our description of the manufacturing involved just machining the lighted mirrors, these are premium priced. In addition to the billet cost, machining time, quality glass and USA hand assembly, there are also various finishes and quality brackets. The result is that the Spectrums run for $799.95. If that sounds expensive to you, we suggest that you resist ever riding in a car equipped with them. Once you do, it is unlikely you will ever be happy without them. Go to www.promotobillet.com/sector seven or call (866) 466-4762 for more info on all of their impressive products.